People are upset at EPA chief Scott Pruitt for something not directly related to his evisceration of the agency he oversees or his climate change denial, although the carbon footprint he’s accruing on all his travels back to Oklahoma is a bit unwieldy. On Monday, the Environmental Integrity Project, a nonprofit group founded by former E.P.A. officials, released a report showing that Pruitt traveled to his home state over 10 times between March and May, largely at taxpayer expense. Documents obtained by FOIA show Pruitt spent 43 out of 92 days from March through May in Oklahoma or traveling to or from the state. Overall, he spent some $12,000 in taxpayer dollars on travel to and from Oklahoma over that period. “How is it that 90% of Pruitt’s taxpayer funded travel has been to his home state? The EPA’s jurisdiction extends to the entire nation, not just Oklahoma, and its assertion that all this travel was related to agency business is ludicrous,” said Evers in a statement. 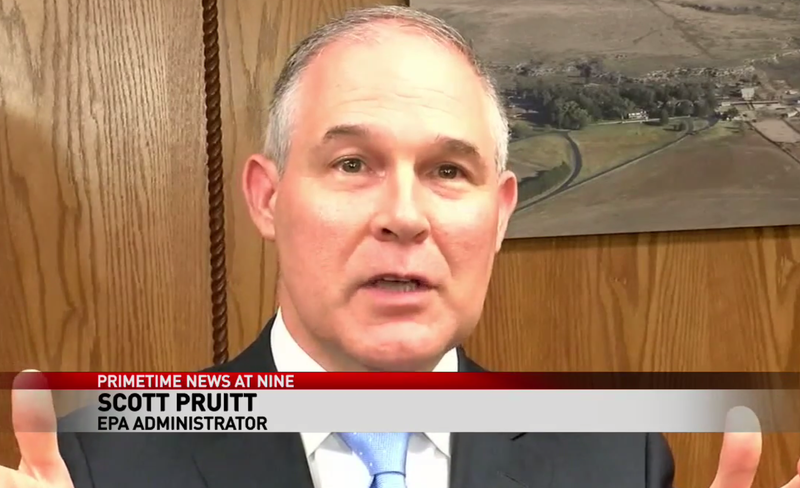 Pruitt had a chance to respond to these accusations on Thursday when asked directly about them during a news conference held, somewhat ironically, during a trip to Oklahoma. He vehemently stood his ground, accusing the group that put out the report of both having the facts wrong and of being biased. An EPA spokesperson told the local Fox affiliate that most of Pruitt’s travel to Oklahoma was on weekends from Friday afternoon to Monday morning, but that EIP calculated that a four missed days of work. “The inconvenient truth is that radical environmentalists are counting weekends, Mondays and Fridays spent in Washington, and holidays like Easter Sunday in their opposition research in an effort to distract from the Administrator’s significant accomplishments, including more than 30 regulatory actions, review of the Clean Power Plan, and rewriting the definition of a ‘Water of the U.S.’” said EPA spokesperson Amy Graham.